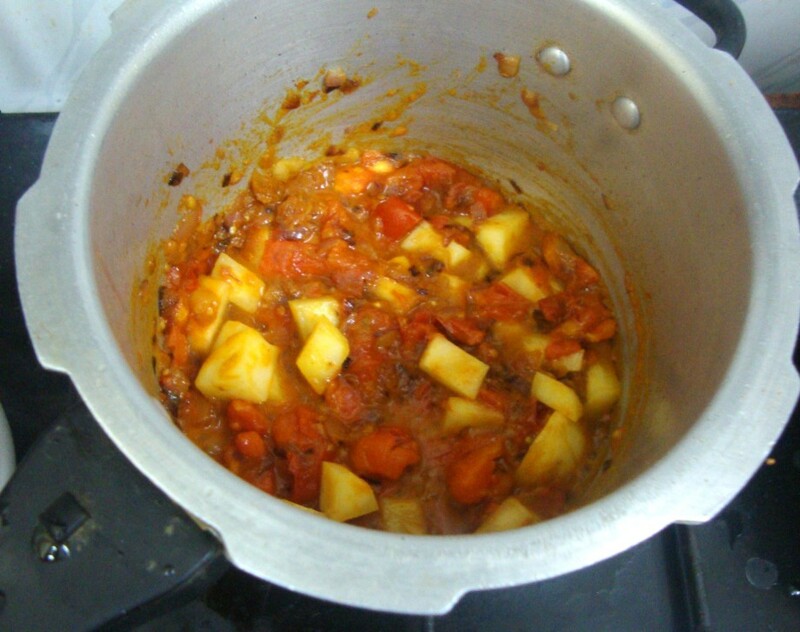 This Aloo Mater is coming straight from the pan! Yes I packed this for Konda's lunch box and she was so mightily taken in by this. 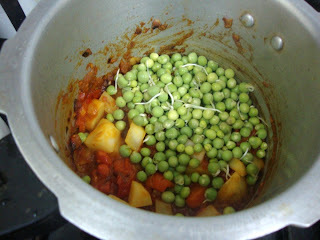 I had these fresh peas lying around for a while, I was wondering what to make with them. Then yesterday Konda happen to say that she was grown up enough not to eat breakfast items for lunch. 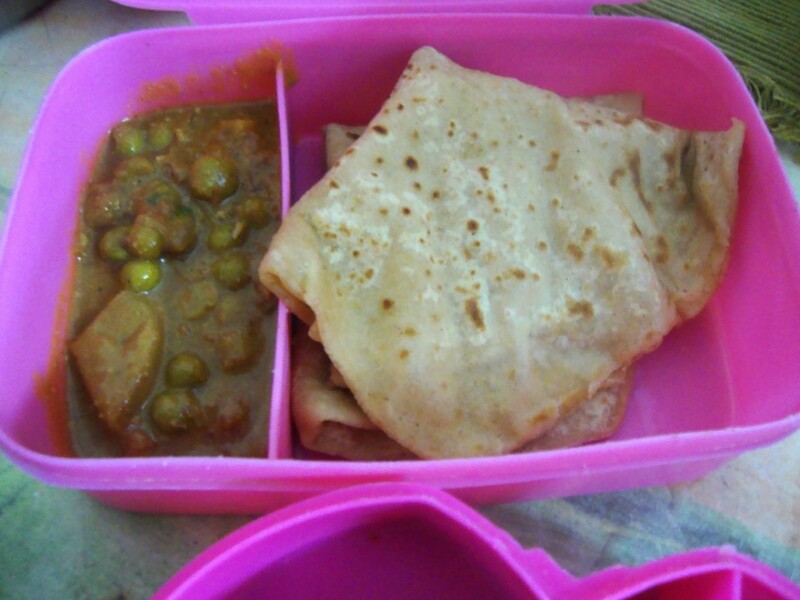 So going by her word, I decided I should prepare something different for the lunch rather than the tiffin items. 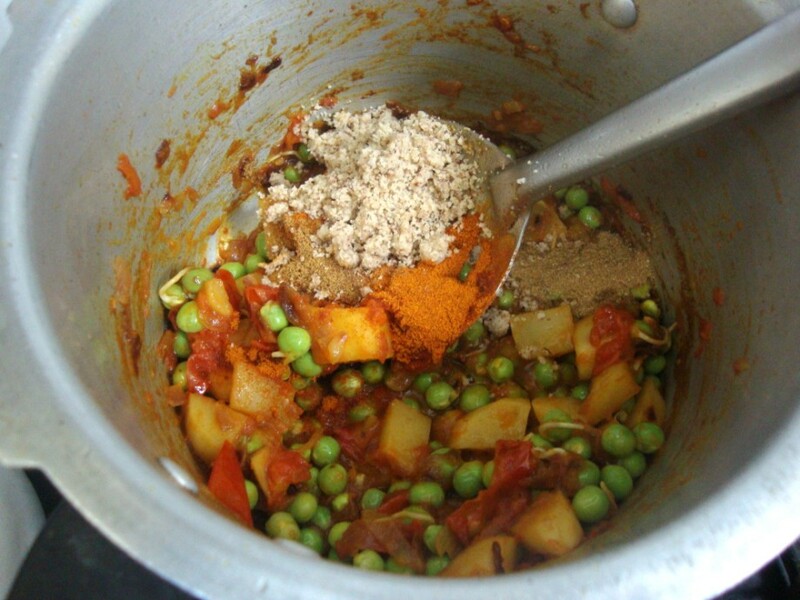 Aloo Matar is a famous Restaurant item and mostly sought after if paneer is not available. 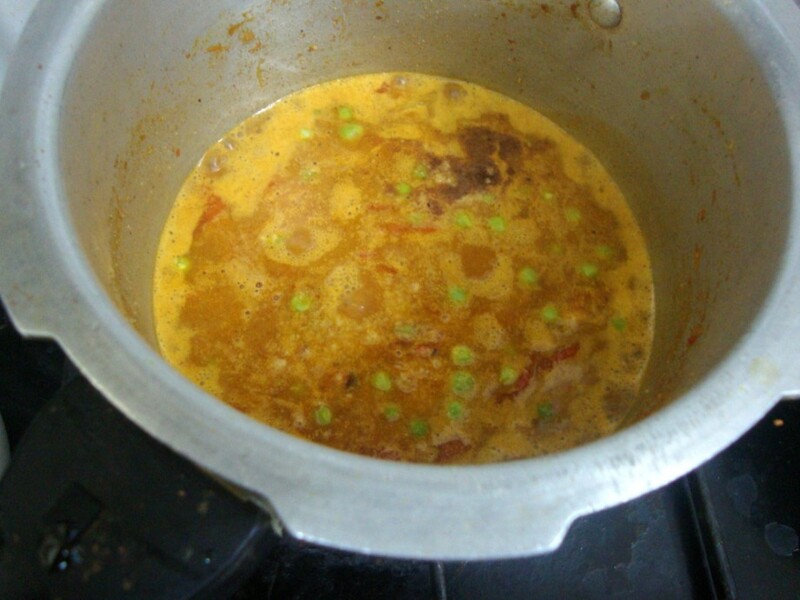 But making it at home makes it more kid friendly as it is not steeped in oil. Heat a pressure cooker, add oil saute finely chopped onions till they turn light brown. Then add ginger garlic paste. Fresh grated ginger and crushed garlic tastes great but not possible in the morning rush hours. 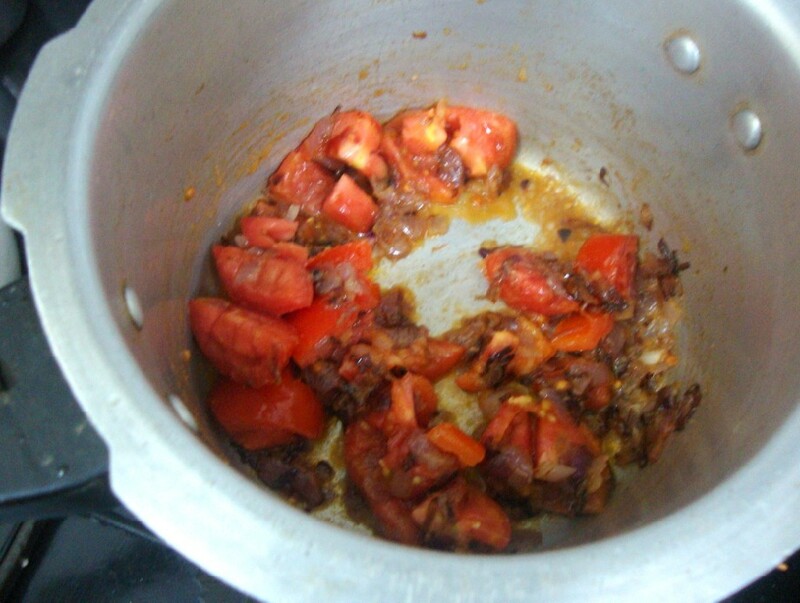 Next goes the finely chopped tomatoes. Add salt for the tomatoes to turn soft. I added turmeric, no cooking without this! Add 1 relatively big peeled and cubed potato to the pan. Saute and simmer for 5 mins with lid covered. Then goes the fresh peas. Stir everything well. 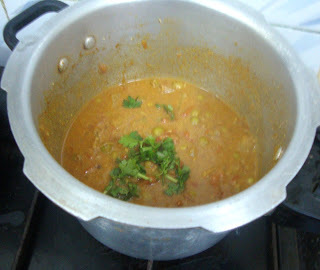 Add enough water and cover with pressure cooker lid and pressure cook for couple of whistles. In a pressure cooker, heat oil, saute onions till they turn light brown. 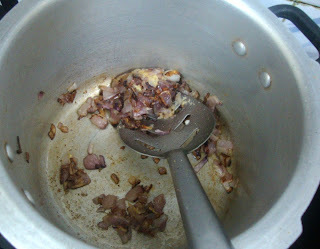 Then add the ginger garlic paste, saute for couple of minutes. Add finely chopped tomatoes along with salt and turmeric powder. When they turn soft, add the cubed potato, simmer for 5 mins, then add fresh peas. Then add the chili powder, coriander powder, cumin powder, garam masala and cashew almond powder. 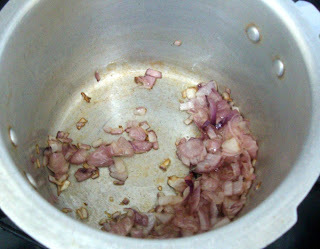 Adjust masala, add water and cover with lid and pressure cook for 2 whistles. Finally add finely chopped coriander leaves and serve with chapatis.